In this four part series, I will be exploring my Leadership in Horsemanship philosophy. The four components to my leadership philosophy include: 1) Honesty, 2) Wholeness, 3) Creativity and 4) Safety. We are half way through the four components of leadership so it is appropriate to recap. Part I is Honesty. In honesty we need to analyze what we can and cannot do at any given time. Sometimes we are not ready for the challenge presented by a horse — but we can learn and get ready. We also need to be straightforward in our dealings with the horses we are working with. Part II described an analysis of the Whole situation — Wholeness. In Wholeness we need to understand how our actions and those of the horse create reactions. Part III deals with Creativity in leadership. Every good leader will admit that he/she do not always have the answer. A leader is someone who gather information and adapts to changes. So you ask — how does Creativity apply to leadership with horses. Well as leaders of horses we need to adapt our methods and approaches to work with each and every horse. Horses are unique and as long as we use principles such as “Pressure and Release”, “Foundation training activities” and understand the “Prey vs. Predator” relationship, we should be able to find/create new ways to work with each and every horse. While we all know that repetition and consistency help in training, we also need to make sure we are creative and keeping the horse thinking and responding to our aides and signals rather than anticipating what we want. Overall, Creativity in Leadership for Horsemanship focuses on the human person learning multiple ways to teach a horse something. There may be 10 safe ways to teach a horse something new — we should be creative (not boring) and learn how to apply those ten different ways. One of the ways I continually work to be creative is that I get to work with other trainers and I also attend (as a participant) clinics taught by others. What I want to emphasize here is that for you to be the leader for your horse and to develop strong teamwork and success — you need to develop a relationship that is full of new experiences. Teach your horse something new, but expose them to many different, creative and new ways that you may ask them to perform. Dr. Mike Guerini is a clinician and author of multiple books and you can learn more about Dr. Mike and his 6 C’s of Horsemanship at http://www.dunmovinranch.com. Dun Movin Ranch is also home to the Equine Hydro-T (www.hydrot.com). Part II continues with some ideas around the concept of Wholeness. Webster’s Online Dictionary defines Wholeness as “An undivided or unbroken completeness or totality with nothing wanting.” That certainly seems to be a mouthful but as I read that definition it struck me that it defines what we are all seeking with horses. How cool! I fixated on the words “nothing wanting” and have contemplated how this fits in with leadership and it struck me that one of the keys of Leadership in Horsemanship is being able to put together a complete package that includes, horse, and rider working as a team. In Wholeness, we seek to understand how everything fits together. The best way I could represent this concept is in the form of a figure with many of the components that make up the complete package of horse and rider. I may be missing some components and I always encourage you to share your ideas and comment. One of many things worth noting in this diagram is that I shaded those items that the horse brings. Notice how the horse brings five items whereas the human brings so many more. The sum of all these items makes the complete/whole package a success. 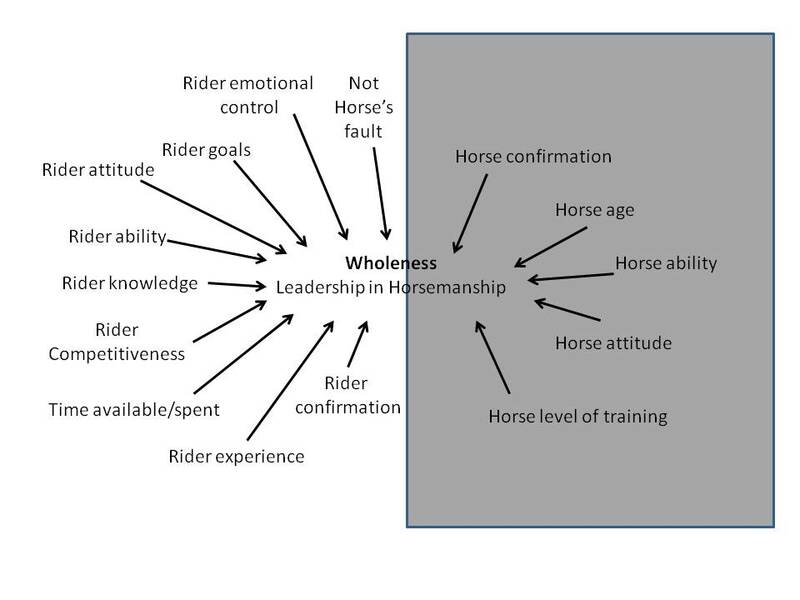 As we take into account the honesty portion and now add wholeness, we see how much of the equation for leadership in horses relies on the human component. To work on our leadership, we need to constantly evaluate where we are with each of the human components and assess our horse on his/her part of this matrix. Share your thoughts and ideas on this write up. Next up, Part III — Creativity in leadership. Dr. Mike Guerini is a clinician and you can learn more about Dr. Mike and his 6 C’s of Horsemanship at http://www.dunmovinranch.com. Dun Movin Ranch is also home to the Equine Hydro-T (www.hydrot.com).